Plenty of wind and rain, is just what these glacial lakes need during the autumn and boy have we had plenty over the last week or two. Anyway the trout fishing seems to be benefitting from a change of water as anglers employing all methods have been reporting fish. Dave Griffith from Surrey fished from the boats with an intermediate line set up and a team of wets to land 3 brownies to 2lb. All Dave’s fish were taken around the weather buoys in the north basin. John Sorenson from Glasgow also took 3 brownies using traditional wets fished on a floater, again from the same area. Meanwhile Peter Johnson from Preston took 12 browns on legered worm from the boathouse banking. All fish were returned! Prospects for back end trout fishing are looking good, there are some real lumps clearing the water in various locations throughout the lake that have not seen a hook yet, so expect good things to come over the next few weeks! The Pike fishing has once again been very good, with float trolled baits and lures out scoring the static approach. The boats are producing the best of the action, however the car park banking has been consistent too. First up Jason Broome from Chester fished the car park banking and managed 4 pike to 20lb 2oz on static deadbaits. Also fishing from the car park John Hicks from Grange landed a fine conditioned 14 pounder to similar tactics. Richard Bradley from Preston landed a 22lb 8oz fish to a trolled lure (see attached photo). Employing our in house guides, Alistair Rushworth and Stephen Cooper from Oldham landed 3 nice pike to 20lb 2oz on float trolled baits and lures. Anyone who fancies a days guided pike fishing should contact the ticket office to arrange a session. We charge £10 per hour on top of our permit and boat prices and the guided sessions must be booked in advance! The general coarse fishing is going down very well with some staggering nets of fish being taken on maggot and feeder tactics. Indeed Jim Corkish from St Helens bagged 30lb+ of silver fish and perch in an afternoon session from the boathouse banking. Also fishing well is the point opposite the ticket office. The coarse fishing is now open until 14th March and tickets for the day cost just £10! Don’t forget for all the very latest information on the fishing you can tune into our Facebook and Twitter pages. Failing that please telephone the ticket office on 015394 36541 and ask for either Dave or Alex! The trout fishing has been testing of late, due to a recent algal bloom, however things are improving now as the water is clearing nicely and conditions are looking good for some fine back end sport. Despite conditions though there has been some nice fish reported, on a variety of methods. Visiting angler Kevin Cooper from Canada took 4 nice browns on float fished worm from the boats. All of which were between 1lb and 2lb. Glyn Evans fished spinner from the boats to take a fine over wintered rainbow of 6lb 4oz (see attached photo). Also employing spinning tactics season ticket holder Joe Reynolds from Barrow took 3 browns from the boats. Christian Jacobson from Liverpool latched into another fine brownie of 5lb 4oz, again on spinner. Meanwhile Will Owen from North Wales tried out fishing for his first time with his son Robin and they landed a cracker of 8lb, again on spinner, which was safely released. Its not just the boys who have been enjoying success. Indeed Kirsty Johnson from Widnes took 2 Brown Trout on float fished worm from the boats. Fly anglers have also been getting in on the action. Hawkshead Angling Club member Dave Bell landed 2 brownies from the boats and another HAC member Bob Swann took 3 brownies in quick succession from the boats. All Bobs fish fell to orange dabbler patterns in conjunction with a Di-3 line. The Pike season has got off to a flier, with a number of good fish reported well into double figures, mainly falling to lure and fly tactics, however there has been one or two out on static deadbait also.Roger Byron fished static deadbait off the car park and landed 2 doubles, the best tipping the scales at 21lb 3oz. Volodymyr Chystakov from London had a day to remember when he fished lures from the boats and recorded 2 Pike over the twenty pound mark. Ross Thompson also took a brace of double figure Pike on lures and Season ticket angler Geoff Birtwistle also had a couple up to 14lb.Meanwhile Big s club members Steve Hinks and Darren Lord have landed many fish to 20lb+ on lures and fly, from the boats. 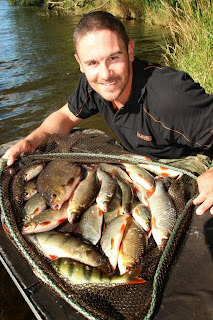 We are now open for general coarse fishing from 1st October until 14th March inclusive. Tickets are £10 each and the use of maggots is allowed. North East based angler Simon Ashton has fished the venue a couple of times over the last week and had some cracking sport with 90lb and 50lb bags respectively. The boathouse banking has been the favoured peg, however there are a good number of fish been coming from the point opposite the ticket office. (see attached picture). Don’t forget to Like us on Facebook or follow us on Twitter, for all the very latest information!